Malta, an archipelago in the Central Mediterranean Sea 93 kilometers South of Sicily has a total land area of 121 square miles and a population of around 413,900. The landscape is mostly low hills with terraced fields. Malta, an Apostolic See, has nine World Heritage Sites and numerous sites of historical importance. It is classified as an advanced economy. The main contributors to its economy are tourism, manufacturing, film production and foreign trade. It is also gaining popularity as a medical tourism destination. Malta is an year-round destination but it is at its hottest in July and August. The shoulder months of June and September are considered best for sightseeing. The sun, the sand and the sea are probably the biggest magnets of the country. Visitors are only too happy to explore the various options for walking, swimming, diving and sun worshiping. 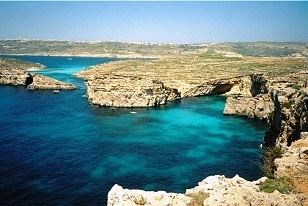 Valleta, Mdina, Gozo and Comino are popular for sightseeing. ‘Ghana’ is an immensely popular musical debate performed amidst folk guitar music background. Maltese cuisine is mostly Mediterranean, based on locally available produce and seafood. Lonely Planet Malta and Gozo 978-1741045086 $12 Around 50 pages of introduction travel information followed by sections on Valletta, Around Valletta, Sliema, St Julian’s and Paceville, Northwest Malta, Central Malta, Southeast Malta, and Gozo and Comino. 56 useful maps and itineraries. Malta Travel Pack 978-1845378493 $8 Useful pocket-book (128 pages) with practical information, a fold-out map of Malta, three detailed area maps and seven town plans. The first stamps of Malta were a set of two stamps released between 1860 and 1861 showing Queen Victoria (QV). The set (Scott #1 to #2) catalogs for around $2000 mint and around $900 used. Malta became a British Empire following the Treaty of Paris in 1814. It was a prized possession mainly due to its strategic location between the Strait of Gibraltar and the Suez Canal. QV themes continued until the turn of the century. Chief among them was a stamp issued in 1886 depicting a QV designs inside a Maltese Cross. The stamp (Scott #14) catalogs for around $125 mint and around $90 used. Maltese Cross is the National symbol of Malta and comes from the symbol of Christian warriors known as the Knights of Malta (Knights Hospitaller). The military order originated during the middle ages and still continues in some form in the USA. Malta released a long set of seventeen stamps between 1926 and 1927 showing local scenes. The set (Scott #131 to #147) catalogs for around $180 mint and around $340 used. The designs show King George V, Valletta Harbor, Saint Publius, Notabile (Mdina), Gozo Fishing Boat, Statue of Neptune, Ruins at Mnaidra, and Saint Paul. Malta is an Apostolic See. The Acts of the Apostles says Saint Paul was shipwrecked on the island and ministered there. Catholicism is the official religion in Malta. Malta released a long set of twenty one stamps between 1938 and 1943 showing historical scenes. The set (Scott #191 to #205) catalogs for around $50 MNH and around $30 used. The designs show King George VI (KGVI) along with Valletta Harbor, Fort Saint Angelo, Verdala Palace, Neolithic Ruins, Victoria and Citadel at Gozo, De I’Isle Adam entering Mdina, Saint John’s Co-Cathedral, Mnaidra Temple, Statue of Antonio Manoel de Vilhena, Woman in Faldetta, Saint Publius, Mdina Cathedral, Palace Square, Statue of Neptune, and Saint Paul. A long set of seventeen stamps released between 1956 and 1957 showing historical scenes. The set (Scott #246 to #262) catalogs for around $160 MNH and around $55 used. The designs show Queen Elizabeth along with Monument of the Great Siege, Auberge de Castille, Wignacourt Aqueduct Horsetrough, Victory Church, War Memorial, Mosta Dome, King’s Scroll, Roosevelt’s Scroll, Neolithic Temples at Tarxien, Vedette, Mdina Gate, Les Gavroches, Monument of Christ the King, Monument of Nicolas Cottoner, Raymond Perellos Monument, Saint Paul, and Baptism of Christ. A long set of fifteen stamps released on March 31, 1973 in the Archeology theme. The set (Scott #454 to #468) catalogs for around $20 MNH and around the same for used. The designs show allegories of archeology, history, folklore, industry, fishing, pottery, agriculture, sport, marina, fiesta, regatta, charity, education, religion, and Arms of Malta. A long set of sixteen stamps released on October 31, 1981 in the Industry theme. The set (Scott #592 to #607) catalogs for around $30 MNH or used. The designs show men hauling building stone, growing cotton, ship building, minting coins, artistic achievements, fishing, farming, quarrying, grape pressing, ship repairing, energy, communications, factories, water drilling, sea transport, and air transport. A set of twelve stamps released on December 9, 1991 in the Tourism theme. The set (Scott #783 to #794) catalogs for around $25 MNH and around the same for used. The designs show Ta’ Hagrat Neolithic Temples of Mgarr, Cottoner Gate, Saint Michael’s Bastion of Valletta, Spinola Palace of Saint Julian’s, Old Church of Birkirkara, wind surfing at Mellieha Bay, boat anchored at Wied iz-Zurrieq, Mgarr Harbor of Gozo, Yacht Marina, Gozo Channel, Statue of Arab Horses by Sciortino, and Independence Monument by Bonnici. Malta hosts three times more tourists than its population every year. Another set in the same theme was released in 1999 and that set (Scott #971 to #975) catalogs for around $7 MNH or used. A set of four stamps and a souvenir sheet released on August 13, 2002 showing Maltese Cuisine. The set (Scott #1082 to #1086) catalogs for around $8 MNH or used. The designs show Kusksu Bil-ful, Qaqocc Mimli, Lampuki, Qaghqa tal-kavatelli, and Stuffat Tal-fenek. The first coins of Malta were Republic Decimal Coinage (10 Mils = 1 Cent, 100 Cents = 1 Pound) Aluminum Mils issued in 1972. The issues have mintage upwards of 30K and catalogs for under a dollar. Reform Coinage (100 Cents = 1 Lira) was introduced in 1982 with the issue of Copper-Zinc Cents. The first issues have very high mintage (over 20M) and catalogs for well under a dollar in UNC. Gold Coins were first issued in 1972 with the issue of a 0.0883 troy ounce coin showing Crowned Arms with Supporters in Obverse and Hand holding torch within map of Malta in Reverse. The issue has mintage of 18K and catalogs for around bullion value. Since then, Malta has issued a number of commemorative gold coins. Coins $2 and up Common UNCs start around $2. 2005 John Paul II Proofs, World Food Day Silver Proofs, etc start around $10. Proof Sets and High Value Silver UNCs from the 1970s start around $30. Low Mintage Silver Proofs, Proof Sets, and Gold Coins go well into the 100s. Paper Money $4 and up Common UNCs starts around $4. UNCs from the 1960s start around $10. Specimens and High Value UNCs from the 1960s start around $50. Low Serial Number UNCs, Scarce large Note UNCs, Specimen Sets, and Bundles go well into the 100s. The main souvenirs of the area are gold and silver filigree, lace, weaving, pottery, and blown glass. Art $10 and up 19th century local scenes prints start around $10. Earlier historical art prints, sleeping goddess statues, etc start around $50. Original works by Robert Taylor, A.M.Galea etc go well into the 100s. Pottery and Glass $20 and up Signed Mdina Art Glass curios start around $20. Mtarfa Handcrafted Glass Paperweights, Minto Gozo and Michael Harris vases, start in the 50s. Antiques $10 and up 19th century maps start around $10. Vintage Maltese Crosses, Order of St John pieces, etc go into the 100s. Miscellaneous Collectibles $25 and up Malta Cruise Ship Snow Domes, French Knight of Malta Statues, Jewel Badges etc start around $30. Vintage Farsons Beer Labels start around $75.